This Event Makes An IMPACT In Our Community! This great event was started by local people who cared about others and wanted to do something that made a difference in someone else’s life. 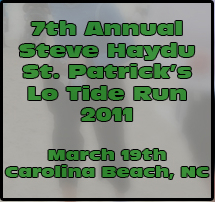 The run was renamed in 2006 in memory of Steve Haydu of Carolina Beach who died from cancer at a young age. All proceeds are distributed to recipients selected by a Volunteer Board of Directors to assist local cancer victims in financial need. The recipients must be residents of New Hanover County, preferably of Pleasure Island, diagnosed with cancer, and without medical insurance or in financial need. All donations are tax deductible. Last year over $40,000 from Registration Fees, Sponsors and Individual Donations was distributed directly to recipients. The impact in their lives of getting much needed financial help from their community is WORTH RUNNING FOR, your participation does matter. This great event is well worth your effort to sign up and participate in. Even if you don’t run you will surely have a fun time with the run and all of the entertainment planned. Let’s help make this year even better. When making plans to participate in the Lo Tide run activities be sure to book your Carolina Beach, NC Lodging early. This entry was posted in Carolina Beach, Spring Events by admin. Bookmark the permalink.